Why, I can't simply run an animation in loop? Although, code works, but it isn't good piece of code. Unity provide a convenient solution for this kind of problems. This solution is named Coroutine. When we run the scene, we will see the same effect like earlier when we used Update() method. and finally yield return new WaitWhile(delegate) - resumes execution after the supplied delegate evaluates to false. Working with asynchrous stuff like WWW downloading. When we want split expensive computations between multiple frames. In this case we use two coroutine functions. In FollowPath method we iterate through path's waypoint array. For each waypoint we run Move coroutine. But we don't run all coroutines at same time. Using yield return allows us to wait until each animation ends. Next path waypoint move will run1 only when previous animation ended. To sum up, coroutines are special type of function that allow us spread the execution of code over multiple frames using the yield statement. To start coroutine we use StartCoroutine() instruction, to stop StopCoroutine(). You can only start and stop coroutines from a class that inherits from Monobehaviour. 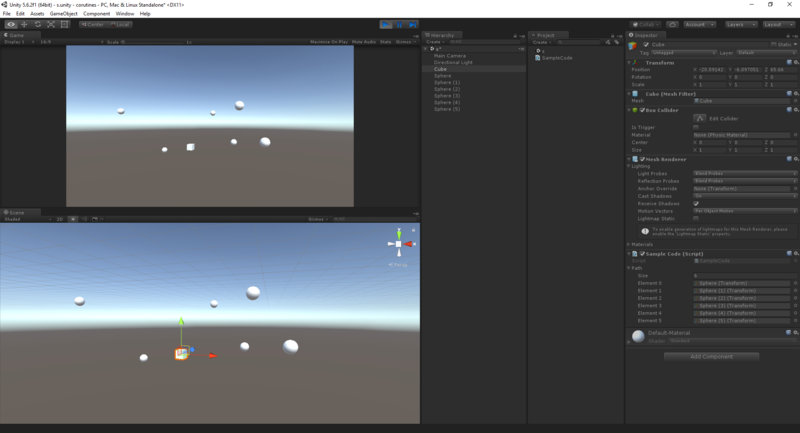 I think that this article will help you to start use coroutines, which are a very handy feature of C# and really helps during work with Unity.